TfL are planning to install ticket barriers at Finsbury Park, the last ungated tube station of any significance*. They'll also be installing lifts down to the tube platforms. The tube station is buried underneath the railway viaduct, so the only access is via narrow passageways that open directly onto the street, with no ticket halls to speak of. A year or two ago they added a new canopy on the east side which will allow the entrances there to be gated without making people queue in the rain. The small Wells Terrace ticket hall will be extended slightly to fit in two tiny gatelines, and the tunnel from Seven Sisters Road will have its gateline positioned deep inside the station, where there's a wider part. 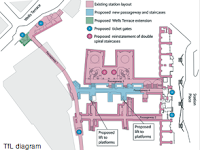 The top end of the lifts will be in a reopened passageway off the National Rail entrance (behind the braille station map in the first photo and the blue area on the diagram). The passageway will be extended so that it doubles as a shortcut from the Wells Terrace entrance to the tube platforms, though you'll need to either use the lifts or go up to the National Rail subway (on the right in the photo) before going down the spiral interchange staircases. It's not clear whether the National Rail entrance will be signposted as a tube entrance via a similar route, but it'd certainly reduce pressure on the tube gateline next door. 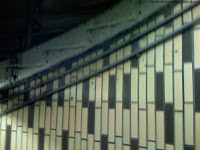 TfL say they're going to "reinstating the disused double spiral staircases", which is strange as they're already open. It turns out the key word here is "double". Each shaft has (or had, in the northbound's case) a second staircase interleaved with the open one (the bottom two photos). This was news to me and I use those staircases every week. While the new gates also cover the National Rail platforms, the step-free access won't. It's stated the plans are compatible with (while completely ignoring) the Finsbury Park "Western Ticket Hall" proposal that appears in Islington Council's Area Action Plan, which was published two years ago. Meanwhile, a consultation over similar modifications at Highbury and Islington ends soon. They plan to demolish the shops the entrance building is hidden behind, create a bus interchange and install lifts. No news on where the lifts will go, but with the platforms so far from the current station building, it's going to be a challenge. OK, I'll bite: where are the gate-free parts of Paddington? All 3 entrances I can think of are gated. At one of them they've only gated the signpostsd route. There's a second route that doesn't pass any barriers. And there's an equally huge hole in the FGW barriers. Will the new London Underground stations on the northern stretch of the Bakerloo line also end up gated? With some of these stations, its hard to see how it would ever be possible! I thought step-free access to H&I wsa planned to be via the old GN&CR station...?